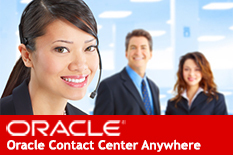 Oracle Contact Center Anywhere is a highly scalable, multichannel contact center solution that enables organizations to communicate more effectively with their customers. This includes queuing and routing of traditional phone calls in addition to email, chat, fax and web callback requests. It also provides blended Predictive Dialer and preview dialing, IVR and call recording. Zoho CRM is a suite of online productivity, collaboration and business applications for businesses of all sizes. Zoho CRM is a Software as a Service (SaaS) solution that delivers complete CRM functionality at a fraction of the price of other offerings. With Zoho CRM you can manage all your Sales, Marketing, Customer Support & Service, Inventory Management and Email within in a single business system. Over 13 million users rely on Zoho apps. Zoho’s productivity and collaboration applications include Email Hosting, Document Management, Office Suite, Project Management and more alongside a host of business applications ranging from CRM and Campaign Management to Customer Support, Accounting and more. Bundle the Zoho CRM with Oracle Contact Center Anywhere(CCA) from Promero and save 18% off regular monthly fees.